HI GUYS! I wanted to share something cool with you, plus a few new links. First, the cool announcement: an experimental/digital artist/composer named Ben Houge has adapted one of my poems, "Ornithological Blogpoem" (from The French Exit and, before that, the chapbook Thanks for Sending the Engine) into a performance piece for voice and mobile devices. The piece will be performed this Thursday, June 4, premiered by the Berklee Valencia App Choir, which he directs, at the Vox Festival in Valencia, Spain. One of the things I like about “Ornithological Blogpoem” is that the structure of it is really evocative of a tree full of birds twittering away (which is a great metaphor for internet communication, e.g., the blogosphere in which these poems first appeared), and I’m hoping to capture that in my setting. 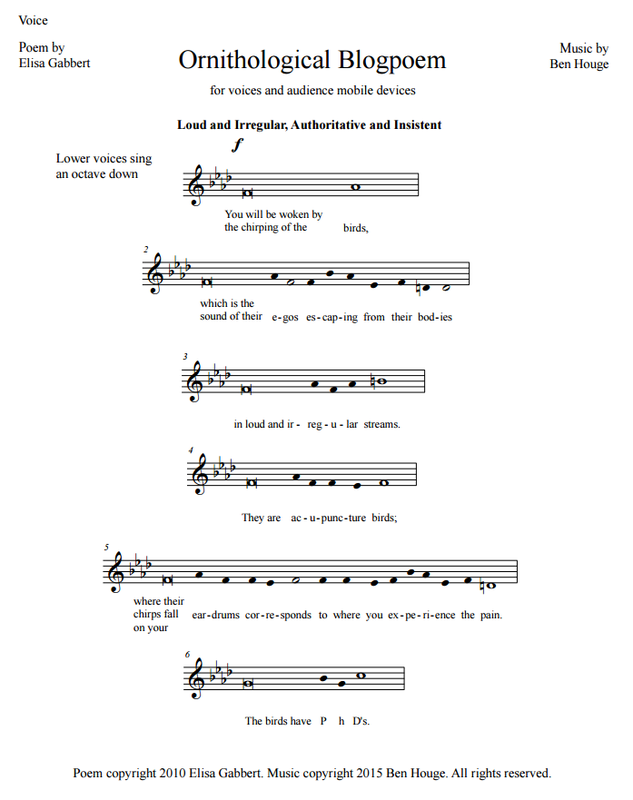 The paper score exists for rehearsal purposes, but at the performance, each singer will be reading the music from a web app that will cue when each phrase happens, resulting in the singers all singing in their own independent rhythms. The audience will be able to join in via a different web app that they can run on their mobile devices, which will present the voices of the singers, manipulated to evoke birds chirping. So the performance itself becomes another kind of internet communication. Unfortunately I can't be there for the performance, but it's going to be recorded, so if I can share a snippet with you later, I will! I’ve noticed that people will look at me longer if I’m wearing sunglasses — with my eyes hidden, they forget I can see them looking. Is it still eye contact when something in between obscures the gaze? The sunglasses act like a one-way mirror — I know when we’re making eye contact, but the other person does not. If both parties are wearing sunglasses, the atmosphere becomes louche and permissive as a masked ball, and we can stare at each other all we like, since neither one of us is sure that the other is looking. More recurring themes: I am very, very tired and can’t get to sleep. I have to pee and can’t find a bathroom, or when I do there’s no door on the stall and I’m too embarrassed to use it. I’m late for an international flight but I’ve left my bag somewhere in the airport and can’t find it, or I’ve left my boarding pass in the automated machine. I need to get between floors in a hotel or airport or mall but the elevators are rickety or missing a wall or the stairs don’t extend all the way. (Elevators are a dream fear; I’m not afraid of them in waking life.) I’m trying to stop my car but although I’m pressing the brake as hard as I can it won’t stop completely and I crash (very slowly) into a building or another car. I’m very angry at someone and trying to physically hurt them but I’m too weak; my blows are ineffectual and don’t land where they should. Sometimes I’m fighting a woman—my mother, occasionally—and, unable to do any damage with punches, I dig into her face with my nails. Everyone I’ve ever known or cared about is mad at me. And I have six new Judy poems in Okey-Panky (with an audio recording here).